Colonel Maybourne appears at O'Neill's home, claiming to have information about a planet with advanced technology that he is willing to share in exchange for a pardon. SG-1 investigates, and finds a temple on a deserted world, probably once home to the Furlings, but the control to a doorway requires a key in Maybourne's possession. Maybourne insists that he accompany the team, and they reluctantly agree, but once on the planet, Maybourne activates the alien device, disables Carter and O'Neill, and leaps through the doorway. O'Neill dives after him, and the two find themselves in a beautiful wilderness with no sign of a doorway. Trapped in paradise, Maybourne admits that the world is a lost Utopia in which he had hoped to retire, but as they explore their surroundings, Maybourne and O'Neill find only an ancient deserted village, with no signs of life, and no means of escape. They must await a rescue as Carter and a team of scientists try desperately to unlock the mystery of the secret doorway. O'Neill survives on rations and fish, but Maybourne begins eating a native plant, and as the days pass, Maybourne grows increasingly paranoid, fearing the planet may not be deserted. Finally, he steals O'Neill's weapon and prepares to defend himself. 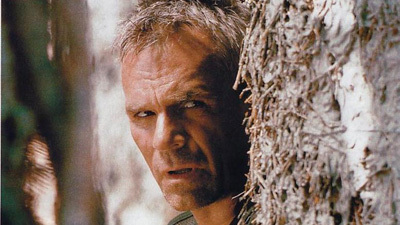 O'Neill discovers skeletons and an artifact which reveal that a Goa'uld had come to Paradise, and that the plant he brought had caused paranoia in the villagers until they rose up and killed each other. The plant has also affected both O'Neill and Maybourne, and in repeated confrontations in the forest, both are wounded. Meanwhile, SG-1 realizes that the doorway sent O'Neill and Maybourne to the planet's moon, and they send a cargo ship to rescue them. Maybourne would rather stay in the deserted wilderness than go to jail, however, and O'Neill offers him the option of a new life on a Tok'ra world. The stone key was originally found over 80 years ago in a pharaoh’s tomb in Egypt, wrapped in a scroll with writing on it no Earth linguist could decipher. The scroll contained instructions for how to use the stone to access the power of the gods. A long time ago, people from an advanced alien society gave up advancements and formed a small isolated utopian community. They sent out representatives to meet and evaluate people from all over the galaxy and offer them a chance to join them. The scroll and the stone were the invitations. The mission to Paradise is Maybourne’s first trip through the gate.